This license shall automatically terminate if you violate any of these restrictions and may be terminated by Rentmore.ca at any time. Upon terminating your viewing of these materials or upon the termination of this license, you must destroy any downloaded materials in your possession whether in electronic or printed format. The materials on Rentmore.ca's web site are provided 'as is'. 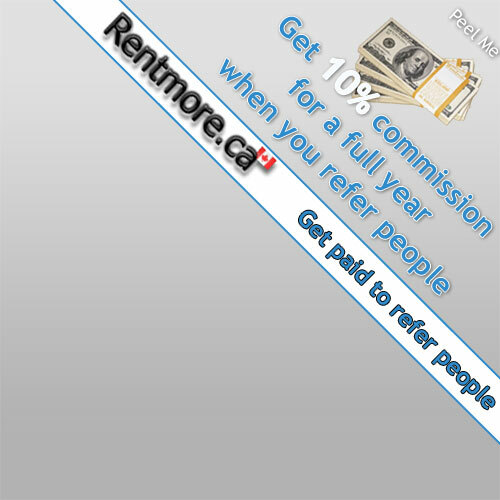 Rentmore.ca makes no warranties, expressed or implied, and hereby disclaims and negates all other warranties, including without limitation, implied warranties or conditions of merchantability, fitness for a particular purpose, or non-infringement of intellectual property or other violation of rights. Further, Rentmore.ca does not warrant or make any representations concerning the accuracy, likely results, or reliability of the use of the materials on its Internet web site or otherwise relating to such materials or on any sites linked to this site. In no event shall Rentmore.ca or its suppliers be liable for any damages (including, without limitation, damages for loss of data or profit, or due to business interruption,) arising out of the use or inability to use the materials on Rentmore.ca's Internet site, even if Rentmore.ca or a Rentmore.ca authorized representative has been notified orally or in writing of the possibility of such damage. Because some jurisdictions do not allow limitations on implied warranties, or limitations of liability for consequential or incidental damages, these limitations may not apply to you. The materials appearing on Rentmore.ca's web site could include technical, typographical, or photographic errors. Rentmore.ca does not warrant that any of the materials on its web site are accurate, complete, or current. Rentmore.ca may make changes to the materials contained on its web site at any time without notice. Rentmore.ca does not, however, make any commitment to update the materials. Rentmore.ca has not reviewed all of the sites linked to its Internet web site and is not responsible for the contents of any such linked site. The inclusion of any link does not imply endorsement by Rentmore.ca of the site. Use of any such linked web site is at the user's own risk. Any claim relating to Rentmore.ca's web site shall be governed by the laws of the Province of British Columbia without regard to its conflict of law provisions. To use our Apartment Finder we will charge a small fee. The fee is an access fee permitting use of this service. The Apartment Finder will look at new rental listings that are made available on Rentmore.ca only. As useful and timesaving as this service is we do not offer any guarantees that the Apartment Finder will find any apartments that suits your preferences. Neither do we offer any guarantees that you will get the apartment that the Apartment Finder finds for you as that is at the sole discretion of the landlord offering the apartment for rent. Our services on Rentmore.ca offers great value through extremely favorable fees for rental related services worldwide. Rentmore.ca therefore does not offer refunds on purchased credits. Either you or Rentmore.ca may cancel use of the Service with or without cause at any time and effective immediately. You may cancel the service by calling (888) 496-0138 or emailing us through the use of Contact Us. You will remain liable for all outstanding payments and fees due at the time of cancellation. Rentmore.ca may terminate the Service immediately without notice if you, in Rentmore.ca's discretion, fail to comply with any provisions of these terms and conditions of service. You will create a password and account when going through the sign up process. You are solely responsible for maintaining the confidentiality of your password and account and are fully responsible for all activities occuring under your account. Rentmore.ca cannot and will not be liable for any damage or loss arising from your failure to comply with this section. Rentmore.ca provides access to a webbased electronic payment service for rent, security deposit, parking and other deposits each as single or recurrent items. This service is offered in order to facilitate electronic transactions between tenants and their respective property owners or managers. Your online rent payments though our eRent service is made through our participating affiliate in accordance with our service agreement. User agrees that he/she has used the eRent service for the purpose of facilitating rental related payments only. User agrees that Rentmore.ca has not made any guarentee of any kind with regard to the obligation of the Manager to Tenant under the lease agreement. User acknowledges that Rentmore.ca is only responsible for processing the electronic transactions that the Payer initiates, directly or through recurrent billing, and does not hold itself out as a collection agency. The user understand that Rentmore.ca will supply both Tenant and Manager with timely electronic confirmation via email acknowledging that a particular transaction has been received as well as being posted in the users transaction history. If such notification is not received Rentmore.ca makes no guarentee that the transaction was ever received. In addition it is the Payer's responsibility to ensure that such transactions are received by the Payee in a timely manner according to the applicable lease agreements executed between the tenant and manager. Any dispute between the tenant and manager regarding amount/timing/lack of payment, overdue rent and the like will be handled exclusively between the Tenant and the Manager. Rentmore.ca is merely providing a means through which Manager can collect, and tenants can remit payment for rent and other applicable costs/fees electronically. Manager agree to sign and execute any and all papers, documents, and verifications required in order to effectuate this user Agreement and its intended purpose and other required thirdparty agreements. Rentmore.ca and other required third party reserves the right to reject or refuse service to any User of the eRent service which presents unacceptable administrative or customer service demands.